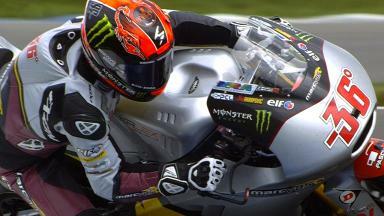 Moto2™ qualifying practice saw Mika Kallio claim pole position for the Red Bull Indianapolis Grand Prix, with Tito Rabat and Dominique Aegerter completing the front row, despite a big crash for Rabat towards the end of the session. Marc VDS Racing Team rider Kallio’s 1’36.883 best lap early in the session gave him his second pole of the year, ahead of his teammate Rabat who pushed for the top spot late on but ultimately crashed with eight minutes to go. Rabat initially looked shaken after the high speed tumble but was able to walk away from the spill. Sachsenring race winner Aegerter (Technomag carXpert) will aim for a second successive victory, this time from third on the grid on his Suter machine. Johann Zarco (AirAsia Caterham Moto Racing), Simone Corsi (NGM Forward Racing) and Maverick Viñales (Paginas Amarillas HP 40) qualified on row two, with similar lap times just over half a second off pole. Takaaki Nakagami (IDEMITSU Honda Team Asia), Sandro Cortese (Dynavolt Intact GP) and Thomas Luthi (Interwetten Paddock Moto2) all secured row three starts, with Sam Lowes (Speed Up) in tenth. An incident packed session also saw crashes for Robin Mulhauser (Technomag carXpert), Ricard Cardus (Tech 3), Alex De Angelis (Tasca Racing Moto2) and Lorenzo Baldassarri (Gresini Moto2), whilst Josh Herrin (AirAsia Caterham Moto Racing) and Xavier Simeon (Federal Oil Gresini Moto2) fell after they tangled towards the end of the QP. None of the riders suffered any major consequence from the incidents. For full Indianapolis Moto2 results click here.